The right on the photo is the R core audio interstage transformer in bare condition. The product is enclosed in the square case on the left. RC-20 is an R core audio interstage transformer. The excellent magnetic properties of R core and precisely wound coil by the computerized manufacturing system achieve a wide bandwidth, low distortion, and low magnetic loss of the transformer. Advanced versatility supporting various circuits and impedances by selecting series or parallel connection of primary and secondary lead wires. High power handling capacity assured by large-size R core can drive powerfully the power tube by using as driver tube a small or medium power tube such as 6CK4, 6BX7, 12BH7, 6V6T (triode connection), 6BM8T, etc. Drive impedance 3.5 Kohms when the primary windings are connected in series. DC current can be superimposed in the primary. Maximum permissible current: 30mA when the primary windings are connected in series. The secondary can be opened (without load). No peculiar peaks and dips are observed in the frequency characteristics even when the secondary is opened. Enclosed in a handy and beautiful square case. 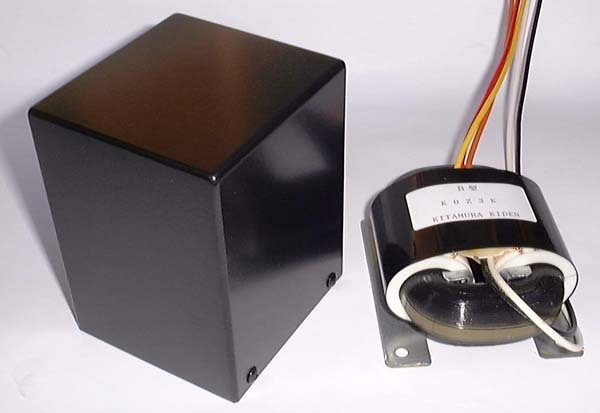 The same mounting dimensions as SOFTONE RW-20, RX-40-5 output transformers, and Tango NC-20F. RC-20 has two windings each on primary and secondary. The table below shows the turn ratio (voltage ratio) of each winding and the phases of lead wires. Series and parallel connections of primary and secondary windings support various circuitries. Voltage ratio 1.8 assures sufficient drive voltage. No gain in transformer with voltage ratio 0.9, however, this connection can drive successfully the power tubes into + grid field. Inverted phase can be obtained and at the same time, the voltage much the same as the primary can be obtained at the grid of power tube to facilitate to drive the power tube. Push-pull circuitry both drive and power stage assures very low distortion output. Low resistance windings and large size core can drive successfully + grid transmitter power tubes. Voltage gain 3.6 can be obtained matching to low output impedance components & circuits, 600ohms line, etc. Can be used as low impedance and wide bandwidth input transformer. Several combinations other than the above are also available. Suitable drive tubes for RC-20 are small/medium power triodes having plate resistance 1Kohms to 5Kohms or small/medium power pentodes in triode connection. Transformer cover case makes it easy to mount this transformer on the amplifier chassis and brings superior form to the amplifier. The same mounting dimensions as those of SOFTONE RW-20, RX-40-5 output transformers and Tango NC-20 makes it easy to mount this transformer on various chassis available in the market. The beautiful finished case is four-side welded construction and black metallic painted. The features are wide bandwidth 10Hz to 32KHz (-2dB) and plain attenuation characteristic up to 100KHz without peculiar peaks and dips. When the secondary is opened (without load), the bandwidth is narrowed but no peculiar peaks or dips are observed. The frequency above 100KHz rises due to the capacitance between the primary and secondary that passes the signal. The impedance characteristic also represents a plain curve without peaks or dips. The graphs below represent the characteristics when the primary is in series connection and the secondary in parallel for single ended input and output using RC-20 as input transformer 1:0.9. The features are wide bandwidth 15Hz to 100KHz (-2dB) and plain attenuation characteristic at high frequency. When the secondary is opened (without load), the bandwidth is narrowed but no peculiar peaks or dips are observed. The impedance characteristic also represents a plain curve without peaks or dips. The graphs below represent the characteristics when the primary is in series connection for single ended input and the secondary in push-pull connection for push-pull output using RC-20 as input transformer 1:0.9+0.9. The features are wide bandwidth 15Hz to 32KHz (-2dB) and plain attenuation characteristic up to 100KHz without peculiar peaks and dips. P-P balance between positive and negative phases is also remarkably good up to 40KHz. A small difference is observed at 40KHz and above. The frequency above 100KHz rises due to the capacitance between the primary and secondary that passes the signal. The graph below represents the characteristics when the secondary is opened (without load). The bandwidth is narrowed but no peculiar peaks or dips are observed. P-P balance is also kept remarkably good. The features are wide bandwidth 12Hz to 50KHz (-2dB) and plain attenuation characteristic up to 100KHz without peculiar peaks and dips. P-P balance between positive and negative phases is also remarkably good up to 100KHz. The frequency above 100KHz rises due to the capacitance between the primary and secondary that passes the signal. The graph below represents the characteristics when the secondary is opened (without load). The bandwidth is narrowed but no peaks or dips are observed. P-P balance is also kept remarkably good. The graphs below represent the characteristics when the primary is in series connection for single-ended input and the secondary is in parallel and inverted connection for single-ended output using RC-20 as input transformer 1:0.9 for inverted interstage transformer coupling operation. The features are wide bandwidth 8Hz to 60KHz (-2dB). The inverted interstage transformer coupling operation tends to have peaks and dips because the inverted electro magnetic transmission and non-inverted transmission generated by the capacitance between the primary and secondary cancel each other. For this, a slight (+-1dB) peak and dip is observed between 60KHz and 70KHz. When the secondary is opened (without load), the bandwidth is narrowed but the peak and dip do not change for the worse. The impedance characteristic also represents a plain curve with only slight peak and dip between 60KHz and 70KHz. The graph below represents the characteristics when the primary is in parallel connection and the secondary in series for single-ended input and output using RC-20 as low impedance input transformer 1:3.6. The bandwidth is 10Hz to 32KHz (-2dB). The features are plain attenuation characteristic up to 150KHz without peculiar peaks and dips. When the secondary is opened (without load), the bandwidth is narrowed but no peculiar peaks or dips are observed. The frequency above 150KHz rises due to the capacitance between the primary and secondary that passes the signal. The graphs below represent the characteristics when the primary and secondary are in parallel connection for single-ended input and output using RC-20 as low impedance input transformer 1:1.8. The features are very wide bandwidth 8Hz to 100KHz (-2dB) and plain attenuation characteristic at high frequency. When the secondary is opened (without load), the bandwidth is narrowed but no peculiar peaks or dips are observed. The impedance characteristic also represents a plain curve without peaks or dips. The primary inductance of the transformer that can be superimposed with DC current on the primary winding has the constant inductance characteristics. This constant inductance makes it possible to drive the power tube steadily without being affected by the fluctuating AC input voltage. The less the inductance fluctuates under various operating condition, the more solid and stable sound quality can be obtained. The inductance of RC-20 is nearly constant, quite independent from the various levels of input AC voltage. The primary inductance of RC-20 is 30H without superimposed DC current. The more superimposed DC current increases, the more the inductance drops and the low-end bandwidth narrows. Although the service limit of DC current is 30mA, our recommended operating condition is within 20mA. The graph below shows the inductance characteristic of RC-20. You will notice its excellent performance. The inductance remains unchanged quite independent from the various levels of signal and superimposed DC current unless the core is saturated at 200V input.